Artists and sponsors have unique relationships. Art dealer, Akua Scott Rahsaan is different. Her business interaction just does not focus on a sole artist. She takes the approach that it takes a village. It was in a very academic village were she was rename. The discovery of her true name was something unknown to her but not forgotten by the fellow educators across the globe. Akua Akua was a name given to me in West Africa as I studies there working on my Masters degree..
Akua Methodologies as well as elementary education. Akua The studies of � I was studying the methodologies used to teach children in West Africa. So I was attending the technology schools, science and technology, Kwame Nkrumah University Science based school and I was on a scholarship there from the State University of New York with 18 other teachers. Akua So the name Akua was given to me and it means female born on a Wednesday. I summoned my mother by telegram and she told me that I was born on April 15 on a Wednesday morning. Akua I didn�t know at the time that they gave me the name. Renata Wow! How did they know? Akua I don�t know. It was something about me that they thought that the name was suited for me and when I came back I adopted the name. Just as others helped her embraced part of her essence, Akua looks to other artists like Frank Frazier to help her discover unknown talent. 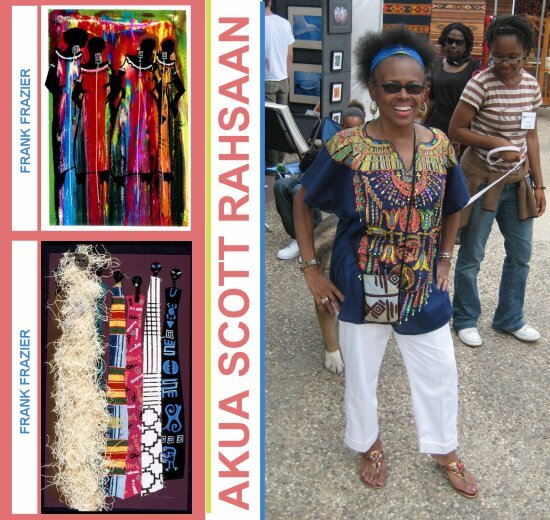 Akua �I would like to tell you a little of what I know about Frank Frazier. Frank has been working in the arts most of his life � He grew up in New York and moved to Dallas about 27 years ago�I�ve been working with him and some of the young artists that he has trained. You can see a few of the artists he has helped.! Akua Like Ernie (Ernie Benton). There were several artists that couldn�t afford the booth price to show their arts here [Arts Fests in Dallas TX, 2009]. But some of them have come out to support him [Frank] or just to see what�s going on in the hopes that they have the financial monies to be apart of this next year. Renata Since you are an art dealer is that a big hurdle for a lot of artist, the actual payment to be apart of things like this Arts Fest? Akua As an art dealer that�s what I do. I paid for Frank Frazier�s work to be seen at the Arts Fest this year  so that�s why I�m here for these 3 days. That�s kind of what we do to help the starving artists. Of course, he�s an international artist but I�m helping him because of all of what he gives to other artists. I work with the artists he has referred to me. [They] just need a chance to have someone pay for their booth and give them the opportunity� I and others have helped Frank to participate in the Essence. Akua Essence Music Festival in New Orleans as well as the Jazz Fest. I was there with Frank at the Jazz Fest about 3 weeks ago. Now�s there�s other young artists that can�t afford that at this time unless they have people like myself willing to take the risk to sponsor that booth price. Renata How would an artist get someone like you to assist them? How would they go about doing that? What is the best advice you can give to an artist? Akua First, they have to have their heart in what they�re doing and I really need to get a chance to interview them, look at their art and get an idea of what their needs might be. It may not be just the direction of putting the booth price out there. It might be something else in the way of marketing their art or encouragement [to go] in a different direction. Giving them some feedback on what they could do with their art. Akua Scott Rahsaan can be reached via email at milesakua@sbcglobal.net or call 214-766-7118. ForgottenGreats.com hopes aspiring art dealers and unmarketed artists have gained a little insight from the conversation with an art dealer who has been in the business over 25 years. This conversation will continue in a series of articles that will allow readers to learn more discoveries about the business of art.